Set of 3 empty bottles fitted with a metal ultra fine tip. Fill with your favorite medium to achieve sharp thin lines. 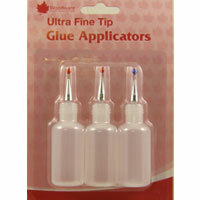 Perfect for making small dots and lines on which you wish to apply glitter or mica.